Drain tuna and butter beans. Slice red onion and olives, halve cherry tomatoes. Chop parsley, juice the lemon. Combine all ingredients together in a large bowl and mix well. Season with pepper and drizzle lemon juice. Serve with a slice of gluten free bread or over mixed lettuce if desired and enjoy. 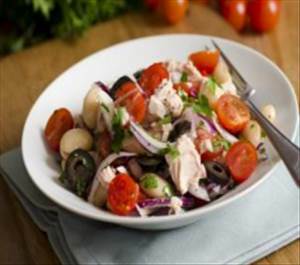 There are 239 calories in 1 serving of Tuna & Butter Bean Salad. Calorie Breakdown: 16% fat, 38% carbs, 46% prot.